Bread Cake. No.1. 4 teacups bread sponge 2 teacups butter 2 teacups sugar 2 eggs - 1 tea spoon soda 1 glass wine nutmeg &c. to taste. Nut Cake. 7 lbs. flour 2 lbs sugar & just wet with new milk 12 ounces butter, eggs & cinnamon. Short Cake. 5 lbs flour 12 ounces sugar 8 ounces butter 8 eggs rosewater & nutmeg. 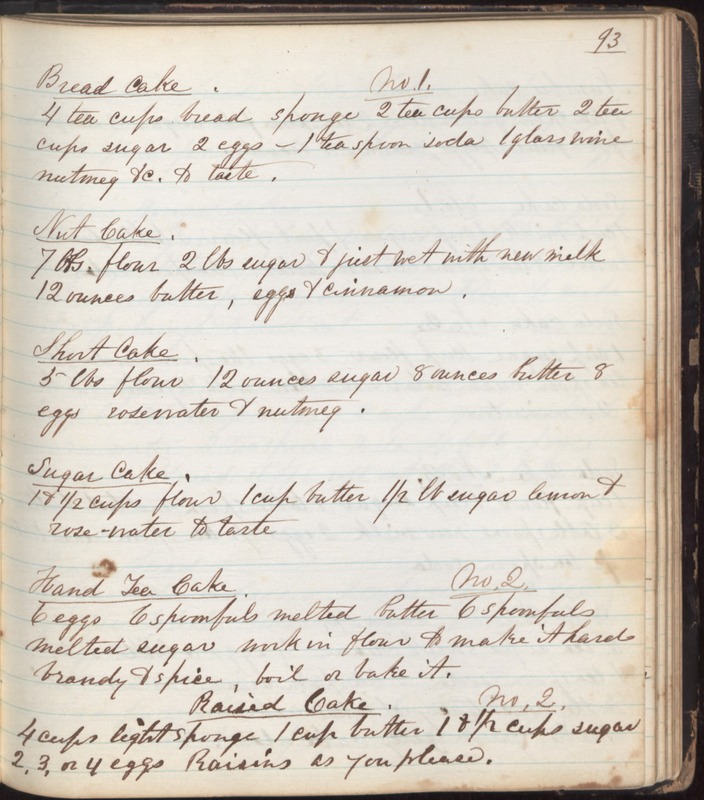 Sugar Cake 1 & 1/2 cups flour 1 cup butter 1/2 lb sugar lemon & rose-water to taste Hand Tea Cake. No. 2. 6 eggs 6 spoonfuls melted butter 6 spoonfuls melted sugar work in flour to make it hard brandy & spice, boil or bake it . Raised Cake, No. 2. 4 cups light sponge 1 cup butter 1 & 1/2 cups sugar 2,3, or 4 eggs Raisins as you please.